Located in Tanglin area, and walking distance to the famous Orchard Road, there’s no exaggeration when the St Regis Singapore claims to offer refined luxury and a true 5 star experience for its guests. Having stayed at a number of 5 star hotels in Singapore over the years, St Regis Singapore is definitely one of the more premium options available. Developed by one of the largest Singapore-listed company City Developments Limited (CDL), parent company of London-listed Millennium & Copthorne Hotels plc, and Hong Leong Group, St Regis Singapore was launched back in 2006 as a Residence and Hotel dual. The St Regis Residence comprise 173 luxury appointed residences and penthouses over two 23-storey towers, and are adjoined by a third 20-storey tall tower housing the 299 rooms and suites St Regis Hotel Singapore, managed by Starwood Hotels & Resorts. You can arrive in style in one of St Regis’ customised Bentley Flying Spur, but a one-way airport transfer will set you back S$270 during normal hours (alternative limousine transfer with a provider like Blacklane will cost a more bank-friendly ~US$60). 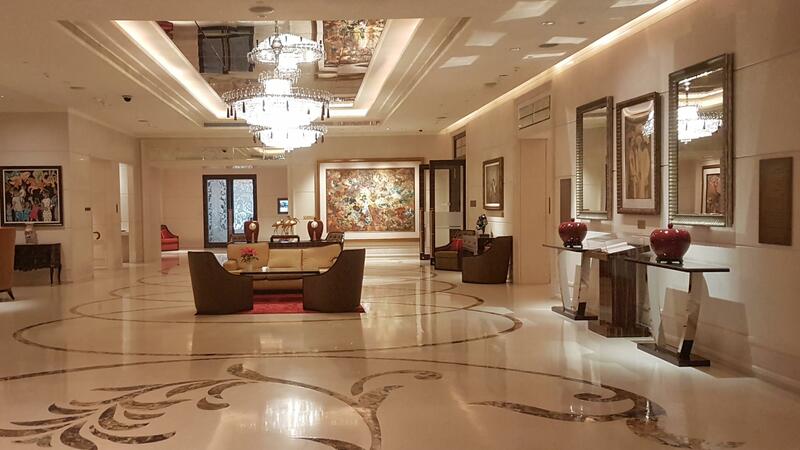 Friendly Porters are ready to assist with baggage on arrival and a short walk from the grand entrance, with an oversized chandelier, lies the plush reception area. Whilst we were offered a seat immediately, we waited at least 10 minutes before actually checking in (probably the only gripe during our stay) but the staff were friendly enough and offered our little boy a St Regis toy teddy bear and kids pack. Despite being the entry-level room type, our Executive Deluxe Room on the top floor certainly wasn’t ordinary and really more like a junior suite, featuring several polished wooden touches, contemporary furniture, and a modern-classic grandeur interior design that completes its luxury feel. At 50 sqm, it must be one of the biggest entry-level hotel rooms in Singapore. The charming bay window is an ideal spot to sit back and relax, as is the king sized bed that has the most comfortable linen. One can do some serious pampering in the spacious French marble bathroom which is no doubt larger than some hotel rooms. Apart from the double basins, a jet massage shower and a beautiful free-standing bathtub, I was most impressed with the heated fog-free mirrors. Want a dip in the bath? I hear the St Regis Butler (available to all guests) is happy to set it up, along with a host of other personalised services to enhance your stay like making a cup of tea/coffee, packing/unpacking, or garment pressing. We really didn’t require the Butler’s assistance during our stay but it was nice to know that it was available if we needed it. Another featured relaxation spot is the Remède Spa, exclusive to St Regis Hotels and Resorts, that houses a separate male and female wet lounge area boosting a large Jacuzzi, outdoor whirlpool, Finnish sauna, eucalyptus scented steam room, as well as sun-loungers (Complimentary access for in-house guests). If Spa isn’t to your liking (how can it not be? ), the heated outdoor pool is another oasis of calm mixed with greenery and sculptures setting a tranquil ambiance. Though on the small side, the gym is well-equipped and opened 24 hours. Breakfast is served in the gorgeous-looking main restaurant, Brasserie Les Saveurs, with views out onto the Residence pool. There’s a wide selection as you would expect, from omelettes, waffles, salads, pastries to the more interesting Singaporean black-pepper crab. Breakfast does get rather busy and on one day, we were sat in the adjoining Drawing Room (lobby lounge) instead of the main restaurant and some guests were redirected to LaBrezza on level two. My coffee also never came but then there’s an Nespresso machine in the room or you could call the Butler. Not without room for improvement, but overall we had a splendid stay at the St Regis Singapore and it does truly live up to be one of the best luxury hotels in Singapore. Leave a comment if you think there are other comparable/better hotels I should try out on my next visit to Singapore.